Next RENDEZVOUS! (March 2nd) is Serge Gainsbourg Tribute Night! Join us this Wednesday, March 2nd as RENDEZVOUS! returns for its monthly session at Verdugo Bar! 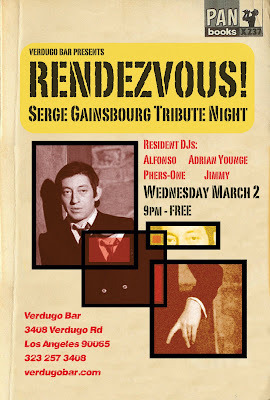 This next session is a special one because it happens to land on the precise 20th anniversary of Serge Gainsbourg's death (March 2, 1991). As a tribute to this fine legend, will be screening three of his classic films, and of course be playing lots of his music - both well known stuff as well as rare gems. We will also be playing our usual gamut of 60's & 70's soundtracks, library, psychedelia, funk, soul, and groovy sounds from Italian & French lost archives! And if that were not enough, a food truck will be serving delicious eats on the patio!